I started with a white card base and cut a Sweet Blush cover plate with the Hexagon Cover Plate. I layered a light grey (Staples) card front with some Mini Blooms stamped in Fresh ink (red currant, fuschia, tuscan olive). I decided the circle needed a frame so I added a Recollections silver shimmer frame and then a Raspberry Fizz 'baby' die cut from PTI's word dies. I cut some thin slivers of foam tape and coloured it with a reddish pink Distress marker to blend it in a bit more. I decided to add some Wink of Stella clear glitter - very subtle but love the way it looks! Here's a better shot of the shimmery die cut - have you tried these pens? They rock!! I bought silver and gold too but I use the clear the most. 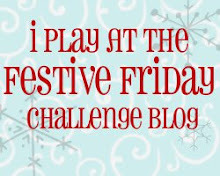 Are you playing along this week? Any creations so far? Love the word die across the widow! Beautiful cards. I am addicted to the Wink of Stella pen too! PTI January Blog Hop - Pretty in pink!